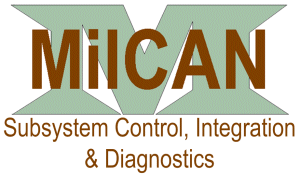 To establish, maintain and broaden the use of MilCAN as the definitive Integration Standard for Military Land Vehicle subsystem communications. MilCAN is a deterministic protocol that can be applied to Controller Area Network (CAN) technology as specified by ISO 11898. Although initially developed for the Military Land Systems domain, MilCAN may be applied wherever there is a requirement for deterministic data transfer.